With over 1,000,000,000 video views per day, YouTube is the king of online video sharing. Mobile YouTube users watch on average 40 minutes of video every day, and the number is only growing larger. But as smartphone and tablet manufacturers embrace high-resolution displays and content makers switch to 4k, not everyone has a mobile data plan that can support our modern viewing habits. And even with a fantastic, unlimited data plan, there are still many situations—subway rides to work, camping trips, remote parts of the country—where reception is bad. As Android users, we face technical issues head on and always come up with clever solutions to pesky problems. The issue of the day is how to save videos for offline use and watch YouTube in places with a bad reception. This time, however, the most attractive solution doesn’t come from a clever third-party developer—it comes directly from Google. On its official website, YouTube Red is described as “a paid membership that gives you an enhanced, uninterrupted experience across YouTube, YouTube Music, and YouTube Gaming.” The service was launched on October 28, 2015, and is currently available to users in the United States, Australia, Mexico, and New Zealand. YouTube Red is actually a rebrand of Music Key, an ad-free music streaming service that launched in November 2014. Google makes most of their mind-bogglingly large profit from advertisement, and ads on YouTube are a very big deal. They generate revenue not only for YouTube but, most importantly, for YouTube’s content creators, who are, after all, the backbone of the site. Unfortunately for Google, people really don’t like to be interrupted when they are about to watch their favorite show, and they don’t hesitate to use ad-blockers to improve their experience. With YouTube Red, Google is giving viewers a way how they can give back to their favorite YouTube creators with a paid membership that helps the creators create next-level content and gives the subscribers a whole range of enticing features. First and foremost, there’s the access to YouTube Red Originals, new exclusive shows from some of the most popular YouTube stars, including PewDiePie, Lilly Singh, and Rooster Teeth. In Scare PewDiePie, the famous game streamer is placed in live scenarios inspired by various horror games, and, for example, in Fight of the Living Dead, popular YouTube personalities are put in a realistic zombie apocalypse scenario. If your subscription box is already overflowing with content and new shows are the last thing you want to hear about, you will be pleased to know that, with YouTube Red, you can enjoy all existing videos on YouTube or any YouTube app without ads. That includes pre-roll or mid-roll video ads, banner ads, search ads, homepage banner ads, and in-video text-overlay-ads. 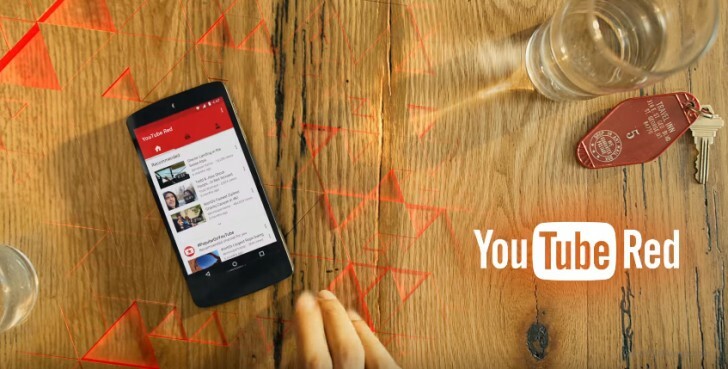 What’s more, a subscription to YouTube Red enables you to save videos on your mobile device for your next trip out of town, and allows you to play videos in the background even with the screen off. The downloaded videos will remain available for up to 30 days. With a YouTube Red subscription, you get an access to Google Play Music at no extra cost, allowing you to listen to ad-free music. The YouTube Music app has been enhanced with Audio Mode, a clever feature that turns off the video stream, allowing you to greatly decrease your data usage. YouTube Red is currently priced at $10 per month. Given that Netflix costs $8 per month, Spotify $10, and Amazon Prime $8.25, the $10 price tag may seem to be quite high. The good news is that you can sign up for a free one-month trial, by going to YouTube’s Red landing page. Once you sign up for the service, you can cancel your subscription at any time. If you don’t like the idea of paying $10 every month just to occasionally download a video for offline use, don’t despair. There are several third-party apps available to help you download YouTube videos for offline use. Mind you, Google doesn’t approve of such apps, so you have to download them from outside the Play Store. 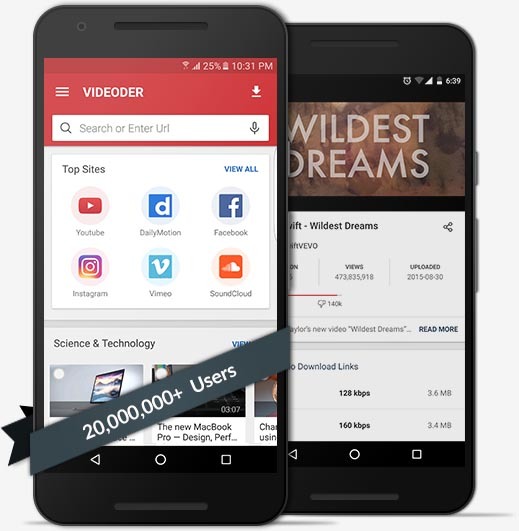 Videoder is a fantastic, free YouTube Music & Video download utility for Android smartphones and tablets. It has already been downloaded by over 20 million users from all around the world, and it can do just about anything you could wish for, including the ability to download any video as MP3, 4K, 1080P, 720P, 480P, 240P, 144P and in 60fps. Videoder is completely ad-free, has a built-in web browser that makes the download process much easier. The app also supports simultaneous download of multiple videos and entire YouTube Channels and Playlists.